The story of Jean Darling, written by Mary Haskett. Miss Jean Darling passed away on Monday January 14th 2013. Jean had been ill for quite some time. She was a member of London First Church. Friday January 18th, the Funeral Service was conducted at the Haskett Funeral Home in Lucan, Ontario. This was a Private Funeral for the family. Pastors Junior and Rose Sorzano officiated the service and I brought greetings from the district. It was a wonderful service and a fitting tribute to a faithful servant of God. A Memorial Service has been planned for SATURDAY FEBRUARY 2nd, 2013 at 11:00 a.m. at London First Church of the Nazarene. This will give everyone an opportunity to celebrate the life of sister Jean. I hope you can plan to attend. On November 23rd, we learned that Jean Darling was taken to hospital and was very weak. Today we have learned that Pastor Ian was in to see her last week, that she is still very weak, but holding her own. Please continue to pray for Jean. 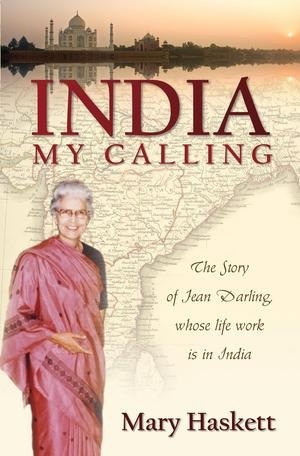 Jean has retired from the mission field, though she served for 40 years in India (1945-1985). She studied nursing at Canadian Nazarene College, then midwifery in India. Jean shares, "As far back as I can remember, I always thought I would go to India as a missionary, not realizing that it would be a reality. Spent 40 years working at the hospital. God helped me to start the nursing training school in Washim and then other missionaries came. I organized the business office, was sent to the boarding school when missionaries couldn't get out, became mission treasurer and even director of the mission for a couple of years. One assignment prepared me for the next, and I always stayed connected with the hospital." "My sister and I are both in the same retirement home. We believe that God sent us here to have a ministry of prayer. Please pray that we will be able to continue this. We pray for all the requests on the Prayer Mobilization Line weekly."